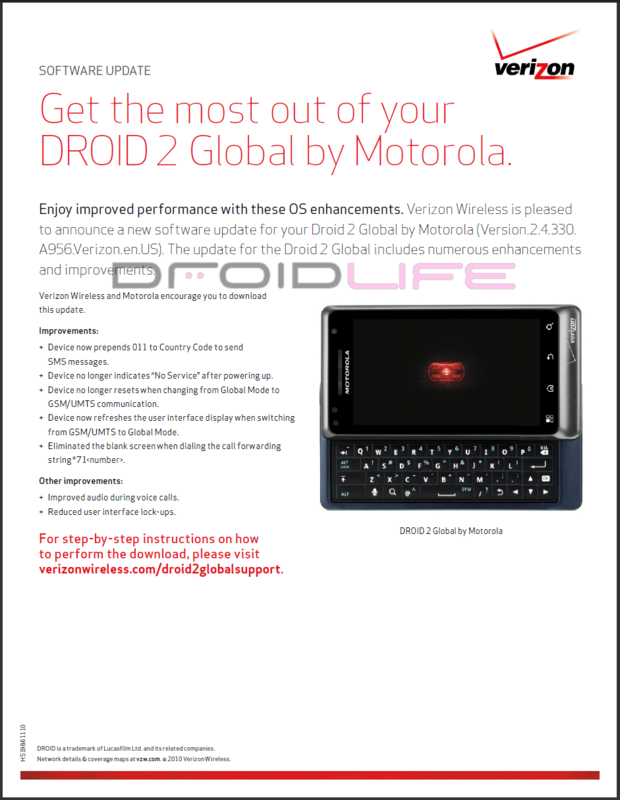 According to the document above which was created on December 7th, a Droid 2 Global update is ready to roll out and improve all of the global features in this 1.2GHz beast. We don’t have word as to when it’ll roll out, but for those of you running into issues while bouncing from country to country, this update should help. + Device now prepends 011 to Country Code to send SMS messages. + Device no longer indicates “No Service” after powering up. + Device no longer resets when changing from Global Mode to GSM/UMTS communication. + Device now refreshes the user interface display when switching from GSM/UMTS to Global Mode. + Eliminated the blank screen when dialing the call forwarding string *71. + Improved audio during voice calls. + Reduced user interface lock-ups. To our D2 Global users out there, let us know if this becomes available. And so you know, this update should fall into the “pull” category which means you can go to Settings>About phone>System updates to check. 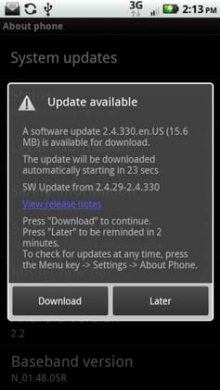 The update is only 15.6MB and your phone will be on system version 2.4.330 afterwards. Angry Birds Seasons Day 16 - High Scores?